Built and improved over the past thirty years, the custom steam engine uses a petrol and kerosene mix for fuel, reaching a top speed of 32km/h and has a range of 16km on one tank of water. While in motion, the boiler is counter-balanced by the water tank on the rear as well as the flywheel, water pump, and the other components. However, [Hudspith] says he doesn’t have an easy go of it carrying the bike up the flight of stairs to his flat — as you can imagine. A steam whistle was fitted to the bike after insistence from others — and perhaps for safety’s sake as well, since it does take a bit of distance to stop the bike. Many people have offered large sums for it — and at least one house in exchange for the bike — but [Hudspith] has held on to this one-of-a-kind steam-machine. A little more about the development of the bicycle can be read here! A video of the bike in action is waiting after the break. [Andrian] has a boiler stove that heats water and sends it to a radiator. As the fireplace heats the water in a boiler a temperature sensor opens the a valve to send the warm water to the radiator. The radiator sends its cool water back to the boiler to be reheated. The valve is slow, so before the boiler can send all the water to the radiator, it’s getting cool water back causing the valve to close while the heat is built back up. To prevent the valve from working so hard and wasting energy, [Andrian] designed a better thermostat to control the valve operation. The thermostat uses one LM85 temperature sensor to check the water in the boiler and another one for the ambient temperature. 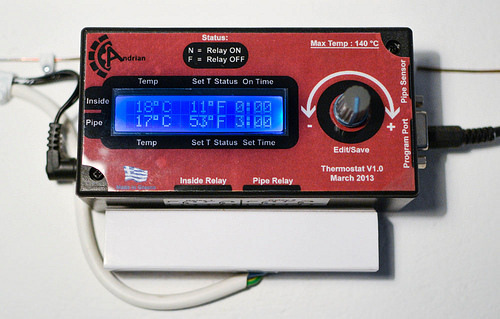 Once the boiler water reaches the desired temperature, the valve is opened via relay. The system waits for half an hour and then checks the boiler temperature again. The brains of this operation is an ATMega168 with a 32.768kHz crystal as the RTC. Code and PCB files are available in his repo. We love to see these types of hacks that challenge the status quo and increase the efficiency of appliances. We applaud you, [Andrian], for turning your dissatisfaction into a positive plan of action and for sharing your experience with the rest of us! If you want to up the eco-friendliness of heating water a bit, you could heat the water with a compost heap. [Firewalker] has designed a great pellet burning boiler (translated). Wood and biomass pellets have gained popularity over the last few years. While freestanding stoves are the most popular method of burning the pellets, [Firewalker] went a different route. He’s converted a boiler from what we assume was oil to pellet power. An Arduino controls the show, but don’t hold it against him. [Firewalker] is just using the Arduino as an AVR carrier board.The software is all written in C using AVR studio. The controller’s user interface is pretty simple. 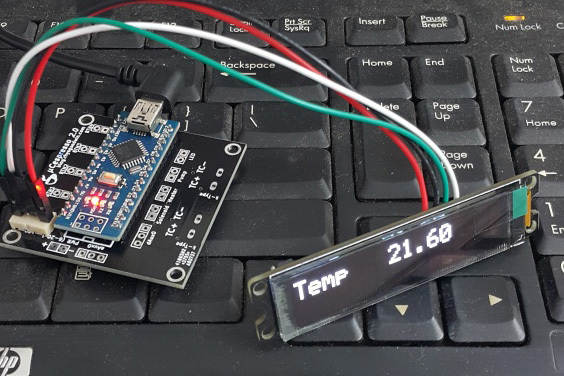 A two-line character based LCD provides status information, while input is via buttons. Once the system is all set up, thermostats are the final human/machine interface. Burning pellets requires a bit of prep. A cleanup of the burn chamber must be performed before each burn. The AVR is programmed to handle this. Once the chamber is clean, new pellets are fed in via an auger system. The burner is monitored with a standard flame sensor. When the fire is up the pellets feed in until the boiler gets up to temp. Then the system enters a standby mode where it feeds in just enough pellets to maintain the flame. When the thermostats stop calling for heat, the whole system shuts down, ready for the next burn.